Delaware North originated in 1915 as a peanut and popcorn concessions vendor; today, it’s a major food and hospitality company serving half a billion customers each year. Its on-premises data center was becoming too expensive and inefficient to support its global business operations, so it turned to AWS to move most of its enterprise applications and operations to the cloud. The move, which reduced its server footprint by more than 90 percent, is expected to save Delaware North at least $3.5 million in IT acquisitions and maintenance over five years. Using AWS also helped Delaware North enhance its security compliance, improve disaster recovery, and deliver services to customers and internal teams much faster than in the past. If you’ve lined up for a hot dog at a sports stadium, purchased a magazine while waiting for a flight, or loaded up on souvenirs at a national park, there’s a good chance that you’ve encountered Delaware North. Though the company deliberately keeps a low profile, it is a leader in the food-service and hospitality industry, serving more than 500 million customers annually at more than 200 locations around the world, including venues as diverse as the Kennedy Space Center in Florida, London Heathrow Airport, Kings Canyon Resort in Australia, and the Green Bay Packers’ Lambeau Field in Wisconsin. That global presence has turned Delaware North into a $3 billion enterprise. But its worldwide operations caused IT pain, including high costs and strained resources. The company struggled to constantly manage, upgrade, and replace about 225 servers that kept business operations going. The construction of a new headquarters building brought focus to its strategic planning—and led to a decision to migrate its datacenter infrastructure to Amazon Web Services (AWS). Delaware North’s data center migration began with small IT steps and C-level business demands for measurable benefits that could convince an executive committee that the AWS cloud was the right approach. Delaware North is a major provider of food and hospitality services in North America, the United Kingdom, Australia, and New Zealand. The company, founded in 1915 as a popcorn and peanuts vending firm, is based in Buffalo, New York. The evaluation process centered on three criteria. First, a cloud solution needed a broad set of technologies that could handle all of Delaware North’s enterprise workloads while delivering support for critical functions. Then, from an operational perspective, Delaware North wanted the features and flexibility to modify core IT processes for greater efficiencies and lower costs. This included eliminating redundant or time-consuming tasks like patching software and pushing test and development tasks through outdated systems that, in the past, added months to the deployment of new services. Delaware North vetted multiple cloud vendors, conducting cost and technical analyses on their offerings and paying close attention to reports by third-party analyst firms such as Gartner. He says the deep technology stack available on AWS was more than sufficient to meet the company’s technical and operational requirements. And the pricing structure of the AWS offerings, which includes paying only for what is used, provided total cost of ownership benefits that Quinlivan could present to senior leaders. A cost comparison done by Delaware North showed that it could save $3.5 million based on a five-year run rate by moving its on-premises data center to AWS and using three-year Amazon EC2 Reserved Instances (RI) and Reserved Instance renewals. Delaware North needed a detailed migration strategy to minimize disruption to company operations. It received assistance from AWS Professional Services in the design phase and worked closely with Cloudreach, an AWS Premier Consulting Partner, on the project execution. “Cloudreach was instrumental in helping us continue to run a 24/7 global business while migrating our entire enterprise infrastructure,” says Scott Mercer, head of the IT department’s service-oriented architecture team. Delaware North moved almost all of its applications to AWS, including enterprise software such as its Fiorano middleware, Crystal Reports and QLIK business intelligence solutions, its Citrix virtual desktop system, and Microsoft System Center Configuration Manager, which is used to manage workstations. The most dramatic physical change was the elimination of 205 servers; everything running on that hardware was migrated to AWS. The IT department decided to keep about 20 servers on premises at the new headquarters building to run communications and file-and-print tasks. “We erred on the side of caution to ensure there is no latency with these tasks, but once we reach a certain comfort level, we may move these to the cloud as well,” Mercer says. 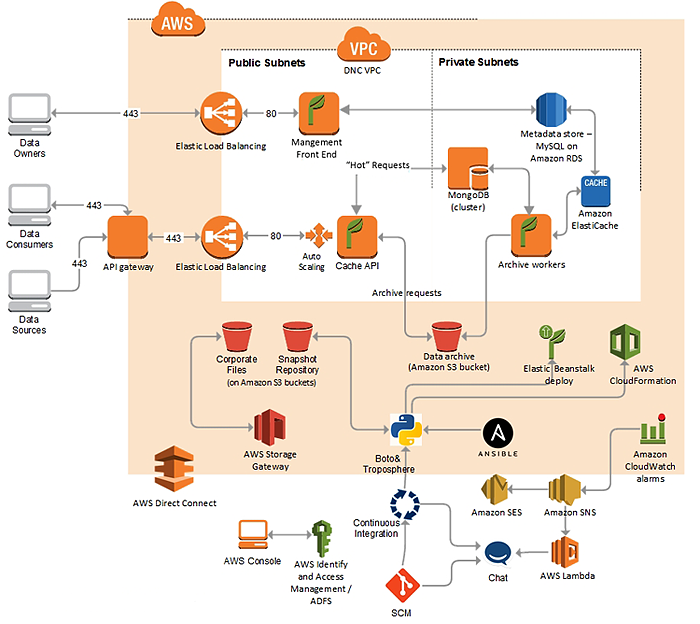 The Delaware North operations running on AWS. Six months into its cloud migration, Delaware North was realizing benefits in addition to its data center consolidation, including cost-effective security compliance, enhanced disaster recovery, and faster deployment times for new services. He adds that the company also has increased its disaster recovery capabilities at a lower cost than what was available in its previous data center deployment. “It significantly improved our business continuity capabilities, including seamless failovers,” he says. The solution is also helping Delaware North operate with greater speed and agility. For example, it can bring in new businesses—either through contracts or acquisitions—and get them online much faster than in the past by eliminating the need for traditional IT procurement and provisioning. It used to take between two and three weeks to provision new business units; now it takes one day. The Delaware North IT team is also using AWS to overhaul its operations by eliminating outdated and cumbersome processes, cleaning up documentation, and leveraging the benefits of running test and development tasks in combination with rapid deployment of services through the cloud. A Premier Partner of the AWS Partner Network (APN), Cloudreach provides cloud-native systems integration that can support a wide range of AWS solutions across full project and operations life cycles. For more information about how Cloudreach can help your company build and manage your AWS environment, see the Cloudreach listing in the AWS Partner Directory. Learn how AWS can help your enterprise computing needs.